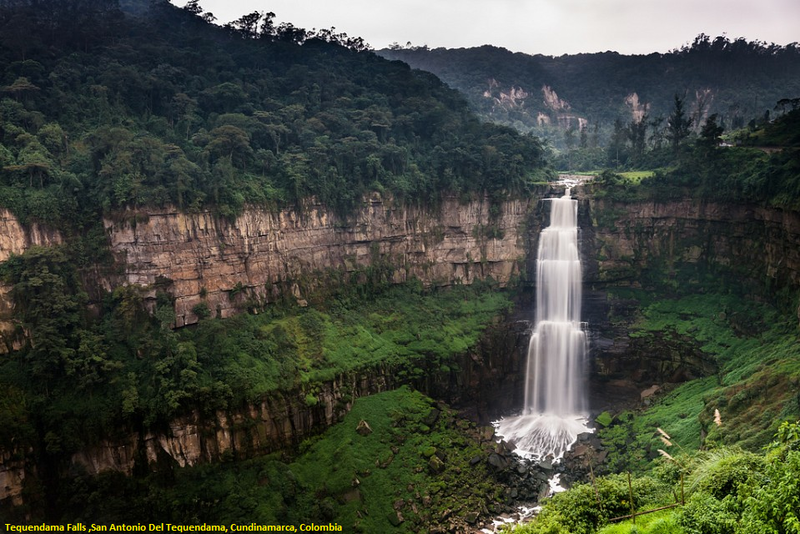 The Tequendama Falls (Spanish: Salto del Tequendama) is a 132 metres (433 ft) high waterfall of the Bogotá River, located 32 kilometres (20 mi) southwest of Bogotá in the municipality of Soacha. During the month of December the falls become completely dry. The falls, once a common site for suicides,may be reached by road from Bogotá. The luxurious Hotel del Salto opened in 1928 to welcome wealthy travelers visiting the Tequendama Falls area. Situated just opposite to the waterfall and on the edge of the cliff, it provided a breathtaking view to its guests. During the next decades though, Bogotá river was contaminated and tourists gradually lost their interest to the area. The hotel finally closed down in the early 90's and was left abandoned ever since. The fact that many people in the past chose that spot to commit suicide, made others believe that the hotel is haunted.